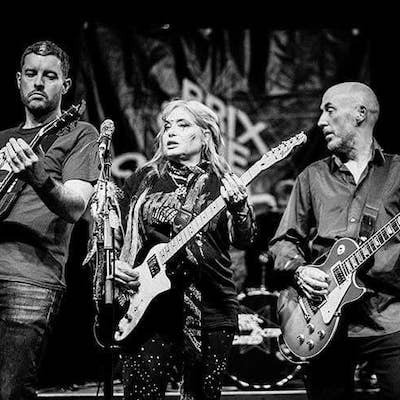 Brix & The Extricated were formed in 2014 by vocalist/guitarist Brix Smith-Start and the legendary bass player Stephen Hanley. Stephen’s brother Paul joined on drums reigniting the Hanley Brother powerhouse rhythm section. The addition of Steve Trafford on guitar brought together these influential, former members of The Fall. The line up was completed with the addition of Irish guitarist Jason Brown. The starting point was reclaiming classic songs from the Fall back catalogue, written by members of the Extricated, which had not been played for 30 years. These key songwriters quickly moved on to writing new material, which forms the basis of their debut album (produced by John Reynolds) due for release in September 2017 on Blang Records. Brix & The Extricated are a sonic juggernaut, with a woman at the helm, infusing the hypnotic brutality with sunlight, harmony, hooks and riffs. Stephen Hanley (The Big Midweek – Route Pubs) and Brix Smith-Start (The Rise, The Fall, And The Rise – Faber & Faber) have both written critically acclaimed, best selling memoirs, about their lives as musicians and their years in The Fall, which are widely available.